Ashley WennersHerron turned to science writing after her mother banned her from conducting science experiments due to an unfortunate incident involving a car battery and a hammer. Formerly the US communicator for the Large Hadron Collider at CERN, Ashley is now the communications coordinator at the Virginia Tech Carilion Research Institute. She still wants to know what the inside of a car battery looks like. Written by Michael Friedlander, executive director of the Virginia Tech Carilion Research Institute. A research scientist and a medical student from the Virginia Tech Carilion Research Institute and the School of Medicine are back from a scientific journey of a lifetime at Palmer Station, a United States research station in Antarctica. What they learned might shed light not only on the biological systems of the icefish, but also on the global impact of climate change. Iskander Ismailov and Jordan Scharping are a part of a multi-university team of heart and brain researchers investigating the mechanisms that threaten the survival of a species that represents 90 percent of the biomass in the great Southern Ocean – icefishes. Icefishes are unique as the only vertebrate species on Earth that lack hemoglobin in their blood. Instead, icefishes developed a type of antifreeze in their blood that allows oxygen to dissolve directly rather than having to be transported to their organs by hemoglobin. However, all is not well for the icefishes. The Southern Ocean is warming rapidly above the freezing point of water. While we still find the water extremely cold, it’s too warm for the icefishes’ physiological systems to operate efficiently, which leads to deleterious changes in their biology and behavior and causes their ultimate demise. We believe the primary problem may be that the icefish heart malfunctions because of excessive stress, or a failure of the signaling mechanism of the nerve cells in the brain to generate normal patterns of electrical signals, or a combination of the two. The expedition, funded by the National Science Foundation, is populated with experts aiming to elucidate the primary precipitating mechanism. That’s how the expedition, at least for Iskander and Jordan, started in my laboratory at the Virginia Tech Carilion Research Institute. When I was a graduate student at the University of Illinois, working in the laboratory of C. Ladd Prosser, we conducted pioneering studies on the effects of temperature variations on the molecular biology, physiology, and behavior of goldfishes. Although my current research tends to focus on mammalian brain plasticity in development, learning, and injury, the Antarctica team approached me to participate in their expedition. Unfortunately, for me, I couldn’t personally make the commitment of several months in Antarctica, with my responsibilities at the Virginia Tech Carilion Research Institute, at the Virginia Tech Carilion the School of Medicine, and on the main Virginia Tech campus in Blacksburg. Instead, Iskander and Jordan volunteered. Iskander, originally from Russia and accustomed to the cold, volunteered instantly. He’s an excellent neurophysiologist in my laboratory, as well as adventurous, so I wasn’t surprised at his enthusiasm. I was more uncertain when it came to offering the opportunity to medical students, who typically pursue research more immediately and directly related to human health. Yet, to my delight, several volunteered. Jordan, a native Californian, was selected and began an intensive training period of 15 months to learn how to perform the delicate procedures necessary in brain research. He did this while also taking medical school classes, attending patient case presentations, and studying for the national board exams. Jordan and Iskander did outstanding work in preparation for the expedition. All of our delicate instrumentation, microscopes, and surgical setups had to be sufficiently miniaturized and made durable for the flight to Punta Arenas, Chile, where it was transferred to a ship and taken south to Palmer Station. As such, the last year has been as much a systems engineering and design project as an experimental biology project. Iskander and Jordan solved numerous problems, overcame obstacles, and engineered solutions throughout the process. Now, they’ve finally carried out the experiment. Iskander was in Antarctica for three months, while Jordan was there for six weeks. They’re due back in the United States this week. It’s winter in Antarctica, so the conditions are cold, windy, and dark, with heavy seas on the crossing. The multiple research teams, including Jordan and Iskander, worked around the clock in a laboratory hut equipped with the necessary instrumentation for their research. The living conditions are Spartan, but wholesome meals were provided and the station was staffed with a surgeon in case of medical emergencies. The teams even got to go on fishing trips – to catch their laboratory specimens. The teams are returning with treasure troves of data to analyze over the coming years. We will likely not only learn about the stresses that icefishes experience, but we should also gain valuable new insights into how extreme low temperatures affect brain and heart function in general. We could learn new things from these amazing critters that may apply to human health, including strategies for treating conditions such as stroke, drowning, traumatic brain injury, myocardial infarction, and heart failure. I am extremely proud of Iskander and Jordan for their dedication to this project, innovative work, and willingness to carry out fundamental research that will likely lay the foundations for future medical breakthroughs as well as enhance our understanding of our planet. If we can help inform rational decisions about managing our precious planet and the species that we share it with as well as learn new principles that may benefit human health, it will be a good day at the office. Photos of the journey can be found on the Virginia Tech Carilion website. The dress is black and blue. Here’s why you’re wrong, white and golders. Warring factions broke out online Thursday night, angrily waving flags of white and gold or black and blue. A bad photo of a striped dress popped up on Tumblr yesterday, and it exploded social media sites through the night, even splitting families into conflicting camps. Others swore the colors shifted back and forth in an optical illusion worthy of David Copperfield. 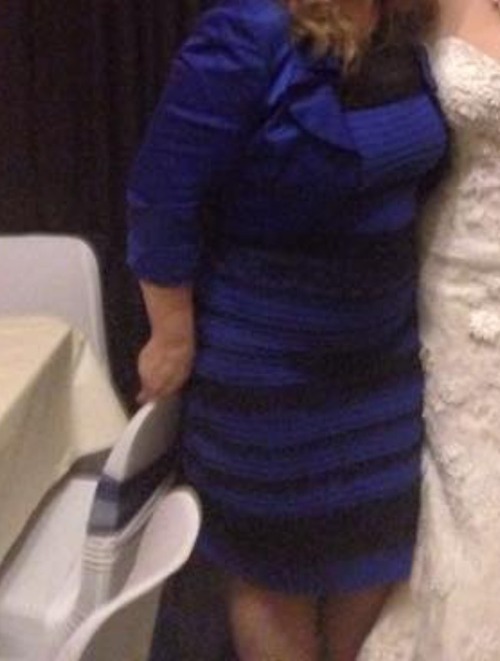 The black and blue supporters were vindicated when another photo of the same dress, in slightly better lighting, definitively showed its true colors. Still, knowing the colors doesn’t necessarily change how a person perceives the dress. Our eyes aren’t playing tricks, then. We’re all taking in the same visual information – we all see the same colors. It’s how our brains rank the surrounding information that decides the colors we perceive. Then why do the colors seem to shift for some people? There’s a lot of surrounding information that we’re taking in. It’s not just the apparent shadow cast on the dress, or the light flare to the right of the dress. There’s also the light from the rooms we’re sitting in, the light from the devices on which we’re viewing the dress, the tilt of the screens, the tilt of our heads, whether we’re wearing glasses. All of these little things heavily influence how our brains choose to interpret the image. The image above, from Wired, shows how the dress can appear to change colors. Basically, we’re all right. Just some of us are more right. For more fun and confusion, check out these color illusions from the Lottolab Studio, a perception research group. Disclaimer: I’ve seen the other photos. I understand the optical illusion of colors and shadows. I know, empirically, the dress is blue and black. And, yet, I still see white and gold. Ebola virus is headlining across the world, including at the Virginia Tech Carilion Research Institute. Erica Ollmann Saphire will present “The Molecular Toolkit of Viral Hemorrhagic Fevers” as a part of the institute’s 2014–15 Frontiers in Biomedical Research Seminar Series. The lecture will take place on September 12, from 11 a.m. to noon, in R3012 at the Virginia Tech Carilion Research Institute in Roanoke. A professor in the Department of Immunology and Microbial Science at the Scripps Institute in San Diego, California, Ollmann Saphire studies viruses with compact genomes. Those viruses, including Ebola, offer the most functional “bang” for the polypeptide “buck,” according to Ollmann Saphire. These viruses are coded with only a few proteins, each of which is critically important to the function of the virus. Ebola, specifically, has seven genes in its genome. Ollmann Saphire and her research team discovered the virus changes function by rearranging those seven genes throughout its lifetime. Ebola looks structurally different as an independent structure than it does as it invades a host. Learning how the physical, molecular changes of Ebola affect the virus’s function has provided invaluable insights for vaccine development. The Frontiers in Biomedical Research Seminar Series is one of three programs at the Virginia Tech Carilion Research Institute, all of which aim to bring the top scientists to Roanoke. Information on all three programs may be found on the Virginia Tech Carilion Research Institute website. Ranking research roots – how do you choose? Science starts with a question. The research is not flashy, even with all of those glinting test tubes and fancy microscopes. It’s slow and specific. Answering that question takes years – sometimes even decades – and that’s just to gather information about one gene or one specific part of a mechanism that might be the solution. There’s no guarantee that the question will ever be answered. The question is usually big: What causes cancer? Why does this gene mutate? When do neurons age? The path to a solution is usually narrow; it has to be, so how does any one ever choose what to focus on? When rising fourth-year Virginia Tech Carilion School of Medicine student James Dittmar had to decide on a research project, he was overwhelmed with having to pick just one thing. Dittmar explored a number of options with his mentor, Gregorio Valdez, an assistant professor at the Virginia Tech Carilion Research Institute, but none seemed quite right. It was in that exploration that Valdez was inspired to guide Dittmar into finding his ultimate project – helping others decide how to focus their own research. Thus, EvoCor was born. EvoCor is a free search engine for genes. Type in a gene and EvoCor searches through thousands of mapped genes, different genomes, and larger datasets maintained by the National Institutes of Health. It pulls together a list of genes that evolved similarly. The genes are ranked by likelihood that they’re related functionally to the initial gene submitted. Take a gene that is already well studied for a certain disease, like MUSK’s role in motor impairment in aging individuals. A scientist can type MUSK into EvoCor and EvoCor will return a list of possibly related genes that might work with MUSK to impair motor function as people grow older. It’s not a slam-dunk, but it’s a far cry better than picking a random gene that may or may not be related at all. It’s a starting point.